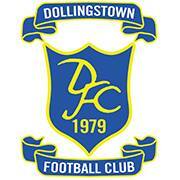 Dollingstown got the first chance of the game, coming close to scoring in the 8th minute as Keith Johnston turned his man on the left wing before crossing the ball in to the box for the unmarked Gary Liggett inside the penalty area but the former Distillery player’s header lacked power and was safely gathered by Whites ‘keeper Jonah Nicholl. A few minutes later, Distillery went down the other end, as Josh Doyle’s cross in to the box was won in the air by Daire Rooney but once again the header lacked direction and went over the crossbar. The early deadlock was eventually broken on 25 minutes as a cross came in to the box with home keeper Stephen Croft sprawling to get to it with the ball eventually falling to James Wright, who was able to flick it back towards Josh Doyle, who rocketed it past the keeper to give Distillery the lead. An important first goal for the club for the young defender. Dollingstown almost levelled in the 36th minute as the corner was won in the air by Matt Walker but his header was again off target and went just over the bar. With three minutes to go to the break it was Distillery who added to the score line as the ball came in from the corner and another first time goalscorer Stuart Moore was on hand to power a thumping header past the keeper to make it two nil. Dollingstown got back into the game on 53 minutes with a goal from Liggett who intercepted Moore’s under hit attempted pass back to Nicholl before taking it around the keeper and tapping the ball into the open goal. Distillery then had a decent effort themselves in the 62nd minute, as Wither’s well struck freekick rattled off the crossbar and went out for a goal kick. After this, despite a lot of Dollingstown pressure, the Distillery defence stood firm and eventually ran out 2-1 winners for their third consecutive league win in a row. Team Line up: Nicholl, Doyle, B. Moore, S. Moore, Curley, Wright, McCaw, Harris, Rooney, Clarke, Withers. 23 March 2019. Bluefin Sport Premier Intermediate League Dollingstown v Lisburn Distillery, at Planter’s Park. COPYRIGHT David Hunter.